I have covered nearly all the tenses there are on my website. But it is the first time I deal with the present perfect continuous tense. It is not an easy tense, but I think it is not really difficult either. To help you teach this tense there is an infographic, a worksheet, an audio and an online quiz. I hope you find these useful. I start the lesson with the following audio file which was created by BBC. My students like these audio files as they are pretty interactive. You should listen to the file first and then stop the recording when the woman is expected to answers. 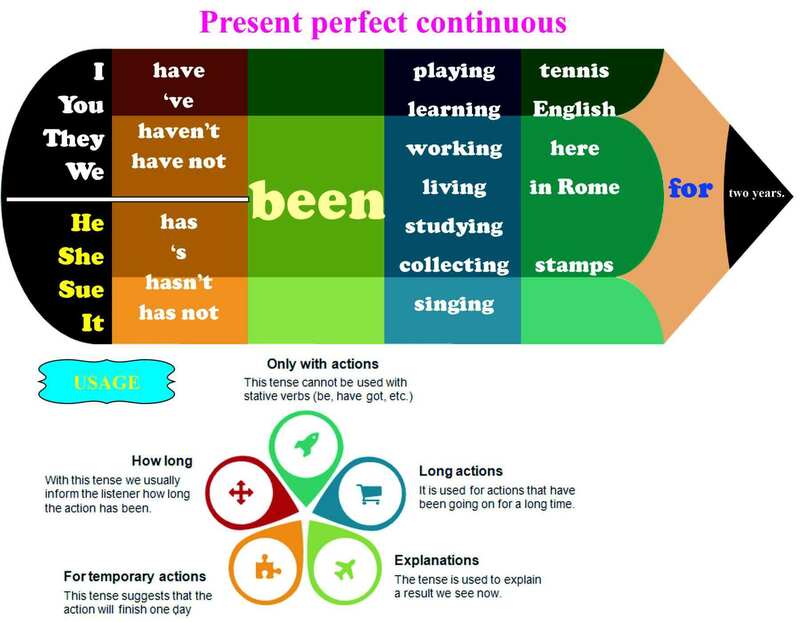 Display the following infographic and explain how the present perfect continuous tense is formed. Then explain the usage of the tense. Print the following worksheet. Seat students in pairs and give each student one page from the worksheet. Thus each student has a different picture. Activity 1: Students look at their pictures and tell their partners whether they have been doing the activities in the pictures. If they say that they have been doing something, their partner immediately asks how long they have been doing it. In this way you ensure that the students listen to each other. Activity 2: Students complete the exercise with present perfect simple or continuous. The following quiz can help your students practise the present perfect continuous tenseat home. The quiz consists of a simple gap fill exercise. Students should complete the text with either the present perfect simple or continuous tense.The students will be rewarded with a game if they pass. The quiz is in HTML5, so it will play on all desktops and mobile devices. You will find a nice explanation of the present perfect continuous tense at British Council site.